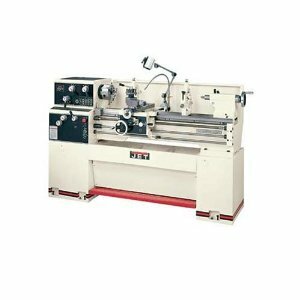 Our geared head engine lathes include hardened and ground gears in the headstock and gearbox. The headstock is constantly oiled during operation and includes splined, not keyed shafts. The gearbox gives large threading and feed capabilities with no gear changes. The D1-4 spindle is precision ground for accuracy and supported by high-quality tapered roller bearings. The spindle actuation control with inch-metric dials are apron mounted. V-way bed design is induction hardened, and the gap bed section is provided for larger diameter work. The compound and cross slide have backlash elimination and adjustable gibs are incorporated in the carriage and slideways. The tailstock may be offset for turning tapers and includes an inch-metric graduated quill. Standard equipment includes; heavy-duty stand, 6" 3-Jaw Direct Mount chuck with top reversing jaws, 8" 4-Jaw chuck, 12" Face plate, foot brake, coolant system w/splash guard, center and headstock center sleeve, work lamp, spindle jog button, and tool box and tools. Digital readout installed.